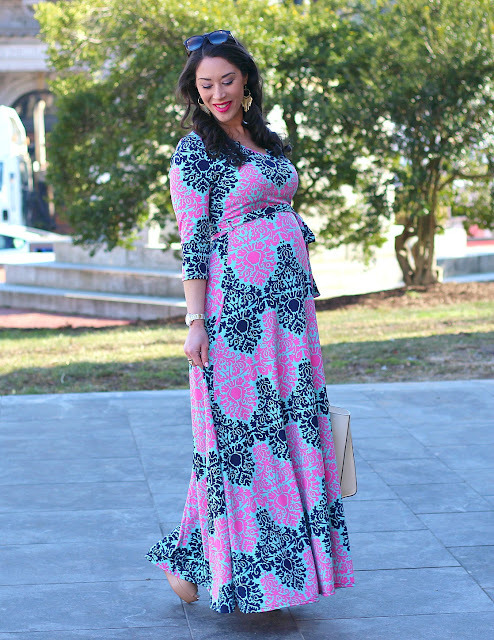 I'm so excited to share this gorgeous maternity maxi dress with you all. 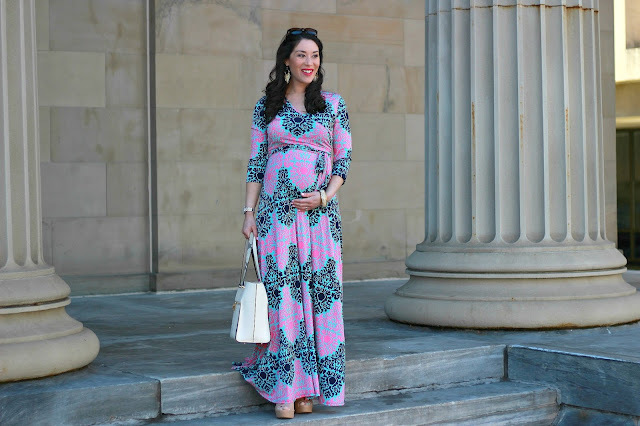 When I saw it on the PinkBlush website, I fell in love with the unique print and stunning colors! I love how comfortable and flattering it is. This maxi is perfect for spring and summer events like baby or bridal showers and graduation celebrations or can be worn for date night or girls night out! PinkBlush not only carries a great maternity line, but they also have non maternity clothing, shoes and jewelry, and even baby clothing and products. By the way, they are having a President's Day sale with 25% off sitewide (use code GRABURSNOW) that ends tonight! 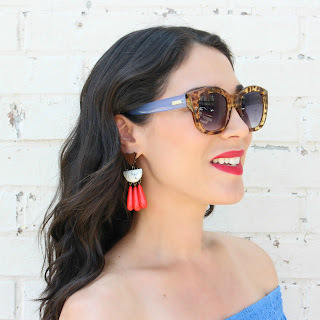 Since this dress is such a stand out piece, I kept accessories pretty simple. I wore my Hazel & Deene brass statement earrings and brass bracelet and carried my ivory Kate Spade tote. 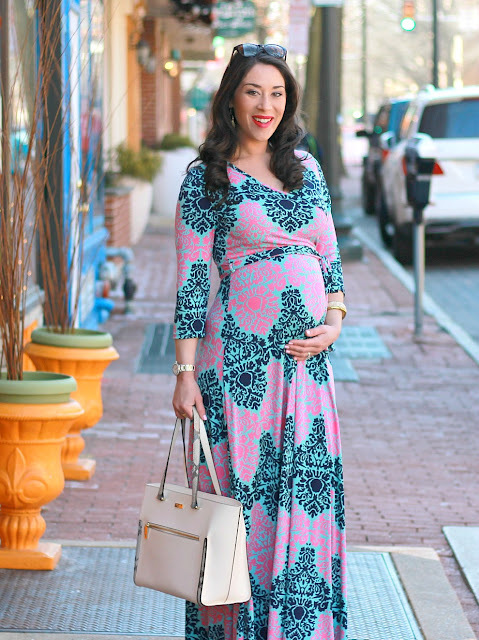 I love how an ivory bag looks with this dress (so springy)! 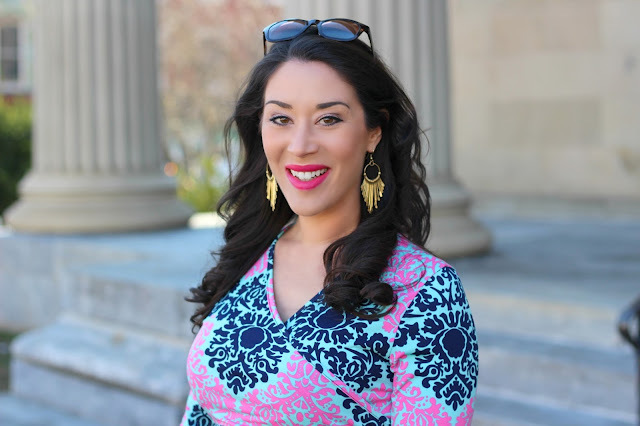 Thank you to PinkBlush for providing clothing for review. All opinions are my own. So pretty! 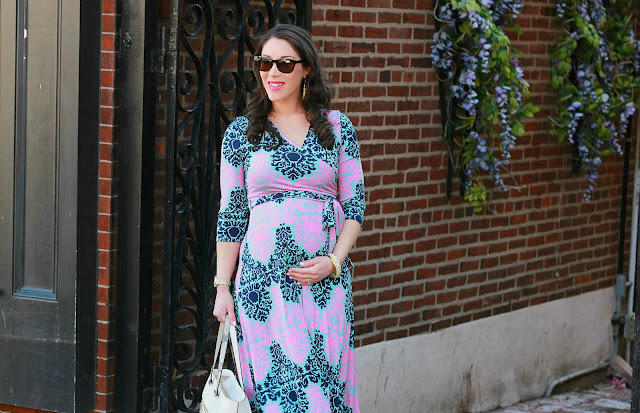 You know I love that bold print! You look so beautiful!!! Wow, Tamara! This is so stunning! 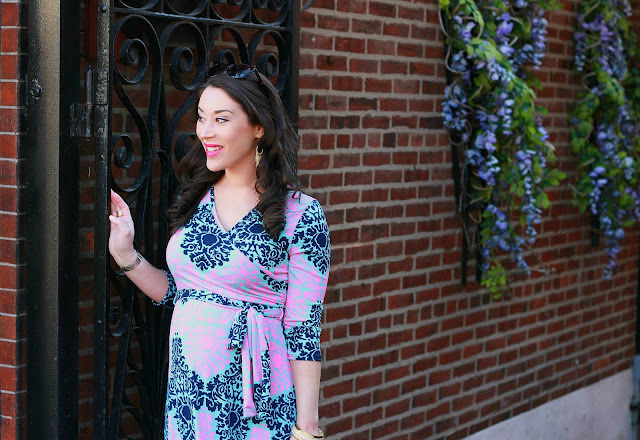 The colors, the pattern, the cut of the dress. 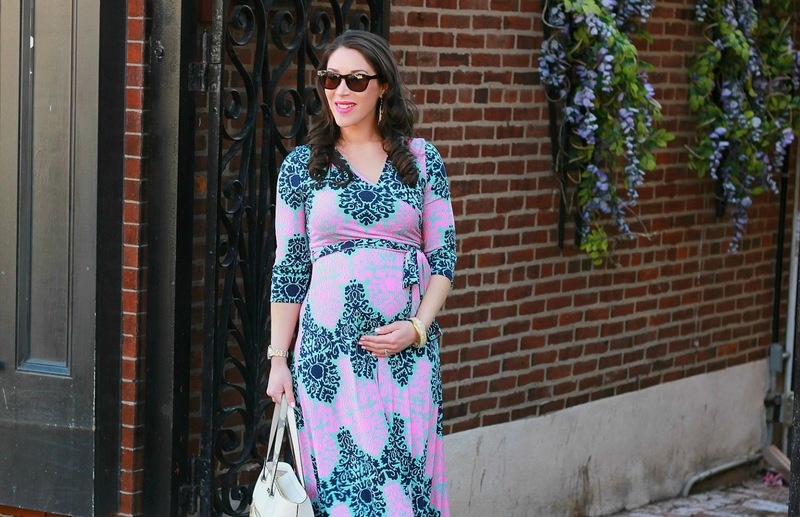 Super bold and flattering. Thank you so much for joining my #SpreadTheKindness Link Up! 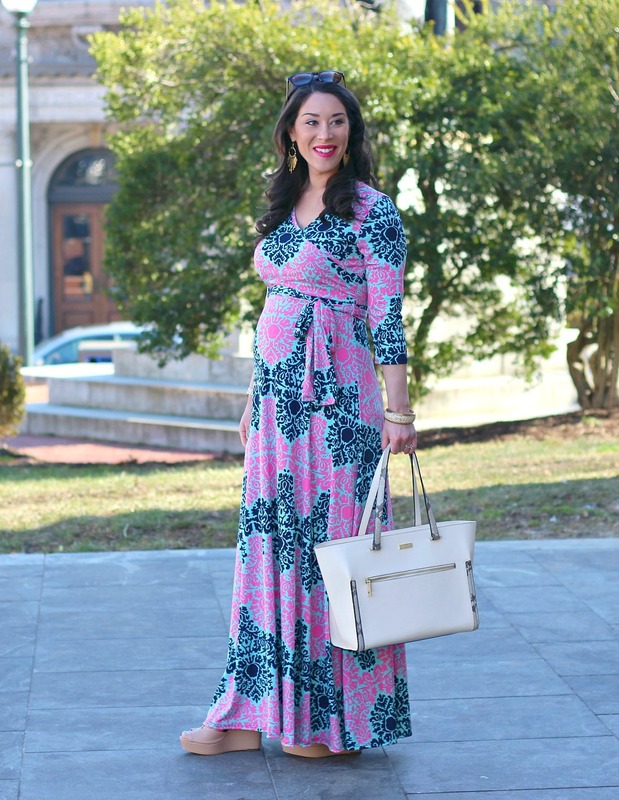 Love this maxi dress on you. When are you due?! Also the colors and pattern are perfect for Spring Damn is it warm there?! As a matter of fact I did a special feature of this outfit and on you, on my Thursday Moda, today. Come take a peek babe and you are welcome!